Honestly, I can’t even remember the last time I had fried rice before I made this dish. My mother used to cook a toned-down version of it when we were kids (basically white rice and a splash of soy sauce), and I most likely ordered some of the stuff at a Chinese restaurant back in the 1980s, but other than that, I hadn’t even thought about the concept in years–I mean, it’s called fried rice, right? Perhaps it was serendipity, or perhaps synchronicity–or both. A few of weeks ago, I had bought some kale with the intention of making raw kale salad. But the avocados, despite having ripened on the counter for a few days, were still hard as baseballs. In the meantime, the kale had exhausted itself in the refrigerator and reclined at the back of the shelf, sprawled limply over the cauliflower. That kale needed to be given a purpose, and fast. I’d been catching up on my blog reading when this recipe , from Maureen and Aly’s blog, Mad About Udon, leapt out at me. True, the original called for collards rather than kale, but I’ve learned that most greens are amenable to standing in for their fellow leafys in most instances. The simplicity of this dish belies its deliciousness. It’s quick, easy, and totally alluring. I realize it’s called fried rice, but, given the number of veggies in the mix (I enlisted some of that cauliflower in addition to the beans and greens), it might as well be called “Veggies with Coconut and Rice.” Whatever the appellation, it’s fantastic. I made this three times in quick succession, and it’s now become the number one recipe of choice when we have kale in the house (having overtaken the previous frontrunner–raw kale salad). Thanks to Maureen for creating this masterpiece, in which coconut features prominently. And I think it’s totally fitting that today’s recipe comes courtesy of another Canadian, since this weekend marks our Canadian Thanksgiving! if you’re celebrating this weekend, why not consider this dish as an alternative to those tired ole brussels sprouts? To those of you giving thanks (or if you’ve simply got a day off), have a great long weekend! With just the perfect melding of salty, spicy, and crunchy, this hearty and flavorful side dish is almost a meal on its own. As Maureen suggests, use Bragg’s instead of regular soy sauce to make this entirely gluten-free. Since I’ve altered the preparation slightly, I’m including my own version here. Heat oil in large frying pan. Add onion and garlic, cooking over medium heat until the onion begins to brown. Add the chili, and cook another minute. Stir in Sucanat, soy sauce, and rice vinegar. Toss over heat for 1-2 minutes . Add the green beans, greens, and cauliflower and continue to cook and stir for another 2-3 minutes, until the beans are bright green and the greens are wilted. 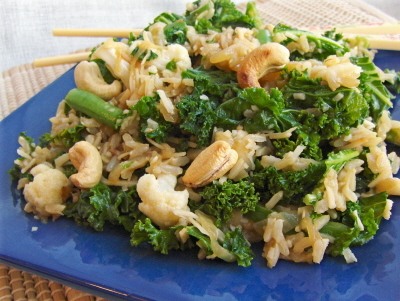 Stir in the rice, coconut and cashews and allow the mixture to heat through (about 3 minutes). Remove from heat and serve. Makes 4-6 servings. Looove your variation AND the Mad About Udon variation – both of your blogs provide so much cooking inspiration, it’s insane (the best insane possible, of course, haha 😉 ). great minds: fried rice is my favorite thing, but I just made a new version of it this week after years of going without it. you rule! how do i go about ordering your food over the internet and get it delivered to me in korea?…. I see our mums used the same fried rice recipe! I forgot to tell you I got your package mailed off to you yesterday so it should arrive soon! I can’t find kale here, but this sounds so good – maybe with broccoli? And no, Guppy wasn’t in the video – though she probably thinks she is! It’s just her favorite song from that live concert. 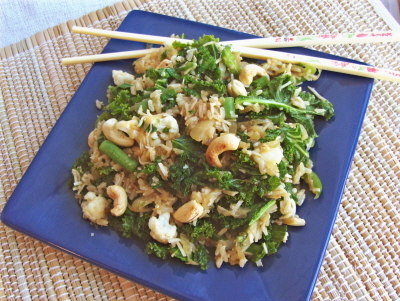 I love fried rice – hardly ever make it at home – visited my mum yesterday and forgot to get more of her silverbeet from her garden – am kicking myself now as I could have made this recipe with it – d’oh! This looks perfect for quick weeknight meal. I appreciate the self-sacrifice in the name of recipes. . . but coconut’s not that bad, really! (I used to hate it as a kid, but have come to love it, actually). Oh, and for the rice? You could easily use spinach or chard, I’d think, if you can get either of those. This sounds fantastic. My husband seems addicted to kale and needs a new way to use it. I’ll pass this along. Yum. This looks really good Ricki! I think I will have to stop serving rice on the side, it definitely deserves it’s own spot! Show me cashews in anything, I am sold. This looks great. Glad you liked the recipe! And thanks for the shout-out. Happy Thanksgiving!! Did we not have the most gorgeous weather ever this weekend in Toronto?? It was 25 today…. Normal soy sauce _is_ in fact gluten-free. Yes, it contains wheat, but when the sauces have been studied they have turned out gluten-free, since the fermentation process apparently destroys all of the gluten. Even Finnish celiac association (and Finnish authorities are not exactly lax!) now admits that celiacs can consume soy sauce.